In just a few hours I will be leaving for India. I feel quite nervous. Even though I was just there in October, I feel that more than ever, I have to make the most of my wonderful opportunity to become attached to Lord Krishna and his devotees through these experiences. Part of that comes from treating the holy dham with the proper respectful attitude, and never forgetting your insignificant position within that place. I have just been reading the wonderful chapter from the ‘Krsna’ book, that describes Akrura’s exemplary arrival in Vrindavan. I remember coming into Vrindavan last year, sweaty and frazzled after driving for hours through fields to avoid roadblocks, bumping up and down and being directed here and there by well-meaning people. My heart thumped as we rounded the corner onto Bhaktivedanta Swami Marg – I felt that I should get out there and then and roll on the ground. But I don’t know if that’s the done thing these days. I pray to Akrura to help me be humble and as he did, meditate on the lotus eyes of my Lord. Krishna and Balarama, who newly came to me a month ago, and behind them, my Radha Vrajamohan. When Akrura entered Vrndavana, he saw Krsna and Balarama engaged in supervising the milking of the cows. 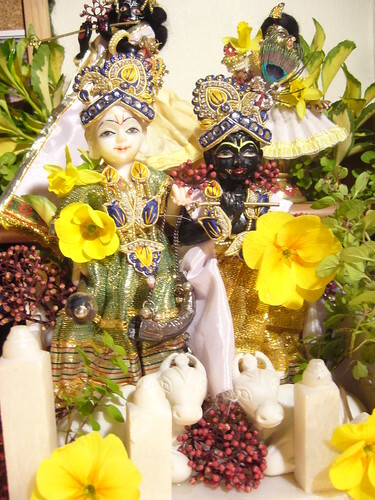 Krsna was dressed in yellow garments and Balarama in bluish. Akrura also saw that Krsna’s eyes were exactly like the beautifully grown lotus flower of the autumn season. He saw both Krsna and Balarama in the spring of Their youth. Although both were similar in bodily features, Krsna was blackish in complexion, whereas Balarama was whitish. Both were the shelter of the goddess of fortune. They had well-constructed bodies, beautiful hands and pleasing faces, and They were as strong as elephants. Now, after seeing Their footprints, Akrura actually saw Krsna and Balarama, face to face. Although They were the most influential personalities, They were glancing at him with smiling faces. Akrura could understand that both Krsna and Balarama had returned from tending cows in the forest; They had taken Their baths and were dressed with fresh clothing and garlanded with flowers and necklaces made of valuable jewels. Their bodies were smeared with the pulp of sandalwood. Akrura greatly appreciated the aroma of flowers and sandalwood and Their bodily presence. He considered himself very fortunate to see Krsna, the Supreme Personality of Godhead, and His plenary expansion, Balarama, face to face, for he knew that They were the original personalities of the creation.